Let's talk about the absolute joy known as a spa treatment, how often do you have one ? have you ever had one ? For me Spa Days are something of a luxury I tend to get bought for me as presents from family, on the times I have had these they have been gorgeous and I have thoroughly enjoyed them, yesterday I had the pleasure of experiencing my very first "at home" treatments delivered by the company known as Blossom and Jasmine, the brand has been established 8 years and over this time has accumulated an impressive VIP client list, it was due to the demands of VIP's wanting hotel, home, TV studio sessions that was the deciding factor for owner Gintare Lisauskiene to bring the treatments to the homes of women all over the country, her team of highly qualified therapists will visit you at your home offering a huge range of luxury treatments, I sampled a Mani/Pedi, full body massage and a facial, truly top to toe. Let me run you through my morning. 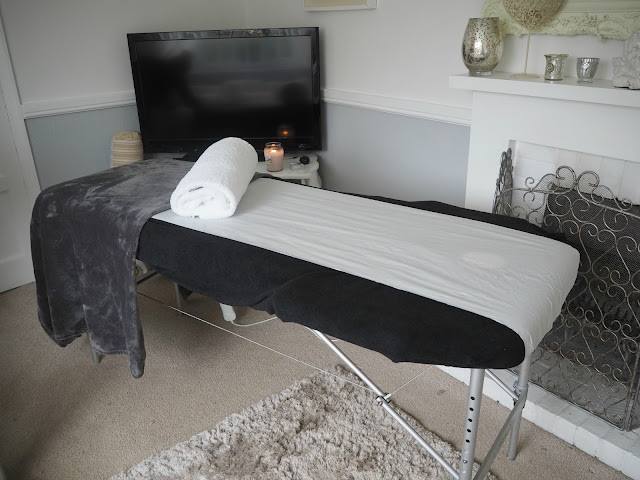 My therapist arrived dead on time with her massage table and full beauty kit, welcomed by me waiting in my towelling robe, she set up in the lounge while I popped the kettle on, I chose the lounge as I needed to keep the cat and dog from bothering us. We started with a the Pedicure which involved soaking feet, nail shaping, exfoliation massage, cuticle trim and polish with Ciate Polish and Seche Vite top coat. Next was the manicure , again with nail soak, trim file and shape cuticle treatment, polish and top coat again with Ciate and Seche Vite all followed with a hand massage using Jo Malone Hand cream, she did a beautiful job on my shameful nails that are in the recovery stage from 2 years of gel extensions ! It was then time to pop up on to the heated massage table for my neck to toe massage using the most luxuriant massage oil, I honestly didn't realise just how tense my muscles were, at some points I actually felt the knots I didn't know where there being relived, this massage lasted an hour and I swear I had to keep myself from falling asleep, also the wonderful thing for me was that there was no chit chat during the massage treatment, not that I am unsociable but I do believe that it should be a stress free relaxing time where you can just switch off to the world and and get the best out of your time, the really funny thing about this experience is that I did wonder beforehand it it would feel odd being at home, I had in my mind that I would feel very strange in my lounge, but not at all, I could have been anywhere in the world I was so relaxed. It was then time for my facial treatment using both Omorovicza products and a massage with By Terry facial oil, my lips were treated with conditioner while the facial was taking place, again no chit chat and me floating on a cloud, the treatment ended with a head massage that nearly sent me away with fairies ! I came to with a smiling face and a soft voice telling me I was done, I was advised to relax in the warmth of the blanket and to be fair I didn't need telling twice as I was totally drifting in and out of a light sleep, when I came to my senses, everything had been cleared away, and my skin was positively glowing. What I would say to you, if possible keep a good amount of time free after your treatments, I was so relaxed I honestly didn't want to do anything else for the rest of the day. Would I do this again ? yes a million times yes, I would do it in preference to a salon treatment as at home you can hang out in your robe and just chill, no rushing to get dressed and drive home, everything is in the comfort of your own space, I know a lot of people feel intimidated by going for a spa treatment, the at home treatment eliminate any of this, this would be a prefect gift to give someone for Mothers Day, a thank you, or for someone getting over an illness, failing that give yourself a gift !! Blossom and Jasmine do gift vouchers which allow the recipient to choose the perfect date and time. Check out the website here blossomandjasmine.com From individual treatments, Pamper parties to wedding make up and corporate events you will find it all. For the whole of MARCH Blossom and Jasmine are offering readers 10% off the usual price of treatments by mentioning the Lavender Barn, just in time to treat Mum.